Without a doubt, Boba Fett’s popularity has spread throughout our galaxy and pop-culture. No other character in the Star Wars universe has been as documented, or has a cult following, as Boba Fett does. Wattographs is pleased to present an essential "who's-who" featuring the various actors and crew members who portrayed the infamous bounty hunter in EVERY form of film, television and media in this multi-part article. 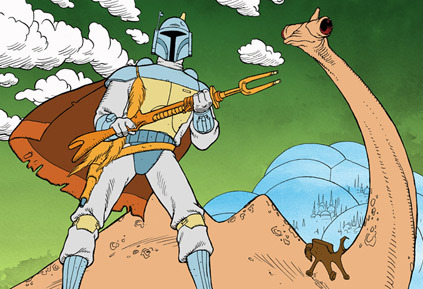 The cartoon deals with Luke, Han, and Leia's first encounter with Boba Fett. During a search for a talisman, the Millennium Falcon crashes on a water planet known as Panna. Upon landing, they run into Fett, who claims to want to help them after saving Luke from a giant monster that attacks him from behind. They all board the Falcon, where Han has been infected by a mysterious sleeping virus caused by the talisman. Luke then contracts the virus as well. Fett and Chewie go into Panna City to get the cure. 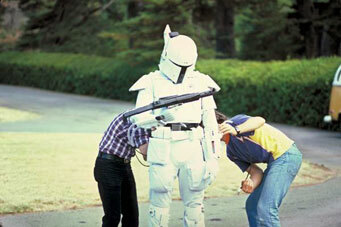 Once they get into the Imperial-occupied city, Fett instructs Chewie to stay behind while he gets the cure. Once away from Chewie, Fett contacts Darth Vader. On the Falcon, as C-3PO is caring for Han and Luke, R2-D2 intercepts the call between Vader and Fett, causing worry for C-3PO. Evading the Imperials, Fett and Chewie return to the Falcon with the cure. After everyone recovers from the virus, they learn of Fett's true allegiances. 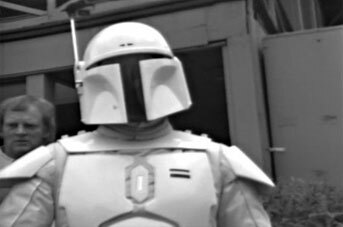 Fett blasts away in his jet pack, promising that they'll meet again. Everyone then escapes from the planet, and back to the rebel base on board the Falcon. 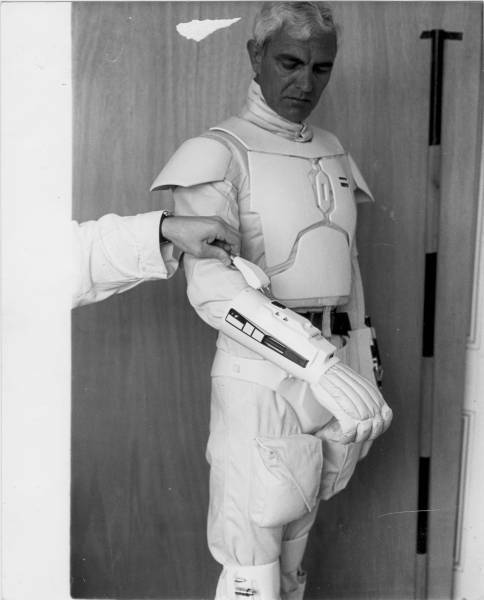 The white Prototype Boba Fett was initially worn by assistant film editor Duwayne Dunham. 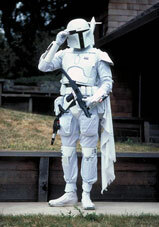 This is the first of Boba Fett’s costume evolutions. 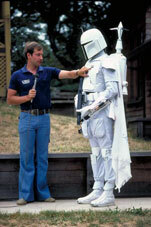 After the costume was fashioned, photos and a 20-minute screen test video—shot behind George Lucas’ house—was made with sound designer Ben Burtt demonstrating the costume’s features. 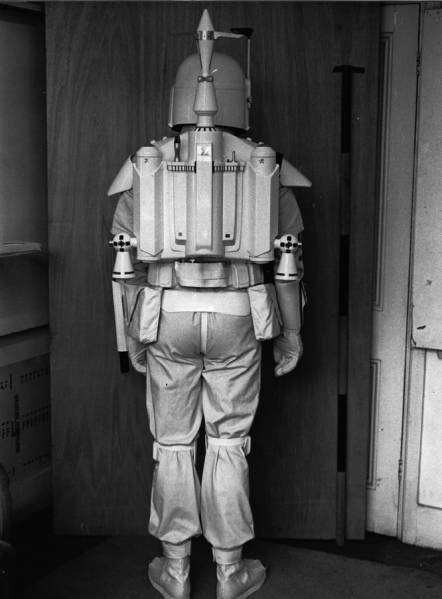 The costume featured a C02 canister in the jet pack, which emitted exhaust out the thrusters, and a wrist flame-thrower fashioned by ILM. Dunham’s arm caught on fire during this test due to a propane leak, so this concept was scrapped. Dunham was not seriously injured. 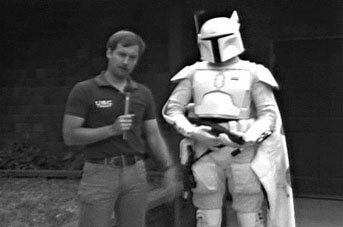 It’s worth noting that the blaster cradled in Fett’s hand is made from a replica Uzi and a flash camera also used to make Luke Skywalker’s lightsaber prop. 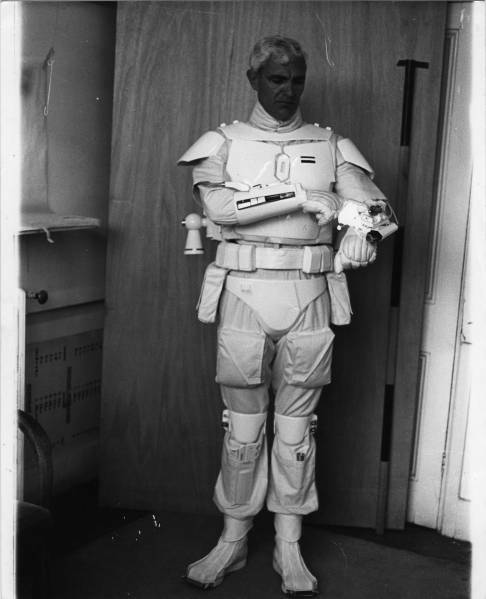 George Lucas was on hand to inspect the costume with associate producer Robert Watts, production designer Norman Reynolds and various crew in attendance. Aside from Dunham, the Prototype costume was also modeled by actor Alan Harris for reference photos. Ben Burtt didn’t recall when asked recently (October, 2011) the exact details of this photo shoot, but it has been confirmed by Harris that it is him in the helmeted image—and that Ben Burtt did indeed take the photos. Harris was also photographed holding various pieces of the costume armor and the harness rigging for reference.